Note: This article I wrote for my area newspaper for International Women’s Day. Thought some of you might enjoy reading it. It’s quite late due to some difficulties in the email reaching Pam, my friend who is posting for me. At least gives you something to read that’s new! The creation of International Women’s Day (IWD) began due to great changes taking place in Europe and America in the early 1800’s. World economies were rapidly developing as the more progressive countries became industrialized. With industrialization, women moved out of their homes and began to work, mostly in factories where conditions were poor and pay was low. As a result, women began to form groups to protest the terrible situation of their working places. The first recorded organized action by working women anywhere in the world took place in New York on March 8, 1857. Hundreds of women in the garment and textile factories staged a strike in protest of low wages, long working hours, inadequate pay, inhumane working conditions and the lack of the right to vote. Other protests were soon to follow, including fifty-one years later, on March 8, 1908, when women factory workers and members of the Socialist Party once again protested in New York City. This was in remembrance of the 1857 march, the right of women to vote, and an end to sweat shops and child labor. The following year, in 1909, the Socialist International Party met in Denmark. A German socialist named Klara Zetkin asked for a special day for women to be decreed called International Women’s Working Day. This day was to honor women and their right to be equal with men. March 8 was chosen as the date. Despite its creation in 1909, the day itself did not become a world celebration until 1975, when the United Nations declared International Women’s Day an international holiday. In many countries throughout the world, IWD is considered a big affair. It is currently an official holiday in 14 countries: Armenia, Azerbaijan, Belarus, Bulgaria, Kazakhstan, Kyrgyzstan, Macedonia, Moldova, Mongolia, Russia, Tajikistan, Ukraine, Uzbekistan, and Vietnam. In addition, women-centered events are held all over the world. There are lectures given by women, gatherings to discuss women’s rights, music concerts and a variety of other activities. As for the United States, IWD was commemorated during the 1910s and 1920s, after which enthusiasm dwindled. Celebrations were revived during the women’s movement in the 1960s, but without its socialist associations. Although the UN later set aside IWD as a one-day celebration, the US went a little further. In 1981, Congress established National Women’s History Week to be commemorated the second week of March. In 1987, Congress expanded the week to a month. Every year since, Congress has passed a resolution for March to be established as Women’s History Month, with the President issuing the proclamation. Although America does designate March as Women’s Month, as far as March 8 itself, the day often comes and goes in our country with little notice. I certainly had not a clue what International Women’s Day was until 24 years ago when I worked in Kyoto, Japan at the YWCA as an English language teacher. The staff of Japanese women carefully prepared for March 8 with a fanfare I had never seen in my own country. A large luncheon was planned with notable women speakers who were well-known for advocating women’s rights. Their topics concentrated on women abuse issues in Japan, targeting the Japanese workplace and household. We also held a Saturday bazaar, with the proceeds going to specific Kyoto projects to help women. With this introduction to International Women’s Day, I began to take more notice of March 8. 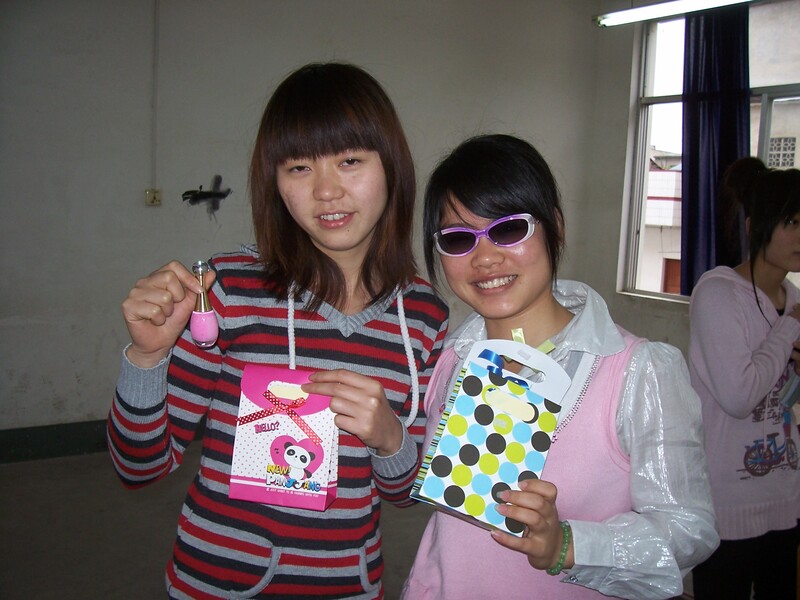 In my teaching placement in Taipei, Taiwan at Wesley Girls’ High School, we women teachers received individual gifts from the school. One year, we were given a cheesecake. Another year, it was 2 pounds of dried pork, presented by one of our students’ fathers who worked in a meat packaging plant. Yet another year, it was a tin of butter cookies from a famous bakery in town. To sweeten the day even more, every gift was accompanied by the traditional Chinese money gift, the hong bao (red envelope). This was from the Parents’ Association. Inside, we found 1,000 Taiwan Dollars ($120 US). Here in mainland China, I have also enjoyed the benefits of IWD. As a college English teacher, I find we women are never forgotten by school officials. At my previous college in Sichuan Province, we had an entire day off with a free tour to a cherry blossom park. We walked about the area, admiring the beautiful flowering trees, chatting, taking pictures and enjoying our complimentary lunch and dinner. 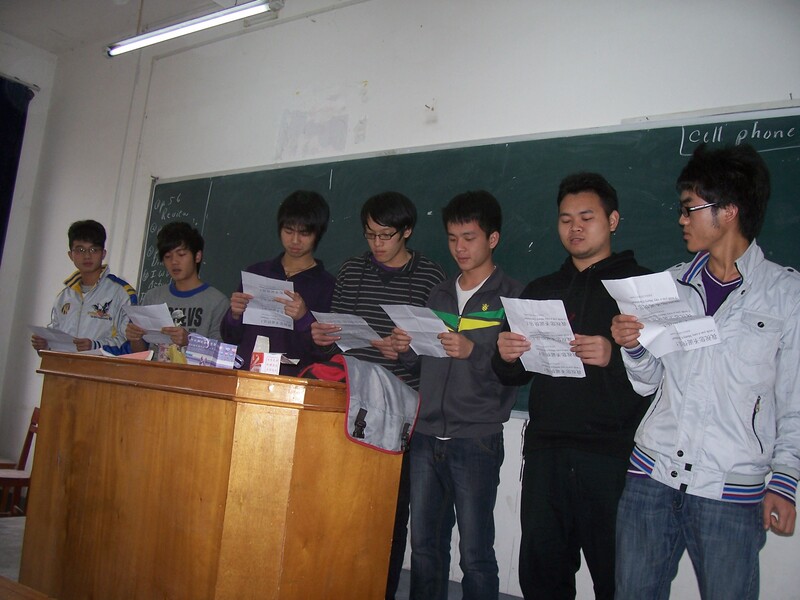 The next year, each department prepared performances. We women were asked by the male administrators to show off our talents in singing, dancing and acting. It sounded like a good idea but the amount of work that went into preparing for our programs was excruciating. After our complaints, the next year there were no performances. Instead, each of our 12 departments was given 800 yuan ($130) to take us ladies out to dinner. 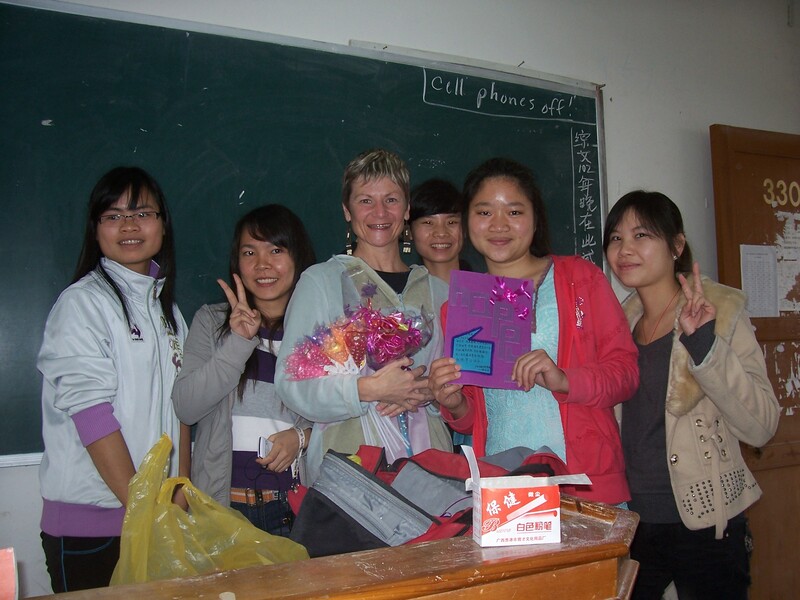 My current teaching placement is in far southern Guangxi, one of China’s 5 autonomous regions and one of the poorer provinces of the country. Our small, rural college doesn’t have the funding to spend on such lavish Women’s Day presents as big dinners or all-day outings. Still, despite the tight budget, the administrators make sure that we are honored in some way. Whether teachers, office workers, cooks or grounds’ maintenance staff, we women each receive a hong bao. 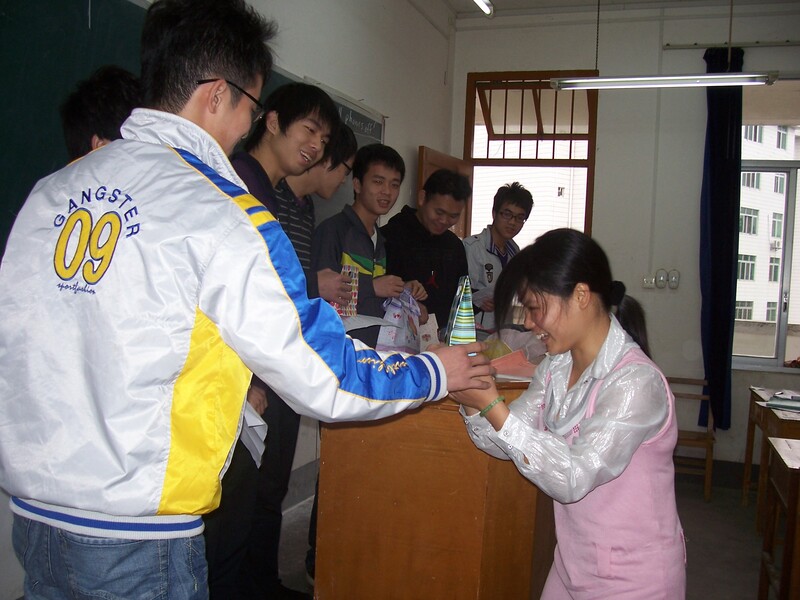 The teachers are given 100 yuan ($16); others are presented with 50 yuan ($9). While the gift isn’t nearly as grandiose as former schools I’ve taught at, the gesture from this struggling college certainly outshines that of my former employers. The average salary of a small college teacher here is $350 a month, with the cooks and grounds’ crew receiving about $50 a month. That little extra money goes a long way in rural China, especially for those who have families to support. To commemorate International Women’s Day in my English language classroom, I always make sure my students are fully aware of this day. My IWD unit includes a history of IWD, current statistics about women in China and the US, and Internet searches done by students on notable American and Chinese women. This year, an added element to the unit involved my male students. 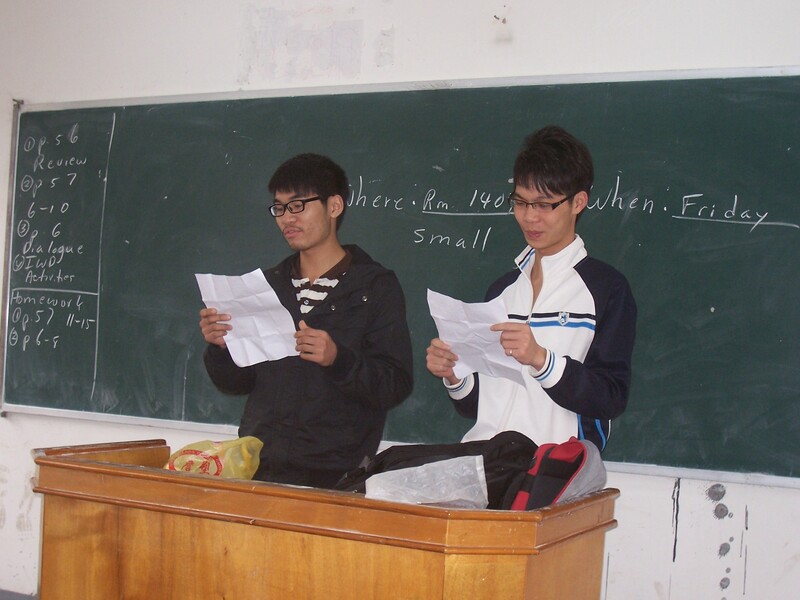 Out of the 240 English language majors I teach, 13 are men. This follows the trend of most Asian countries, where liberal arts’ study falls mainly to college female populations. To give our women students a meaningful day, the gentlemen in each class serenaded the ladies and held a drawing for prizes which they purchased themselves with funds from me. 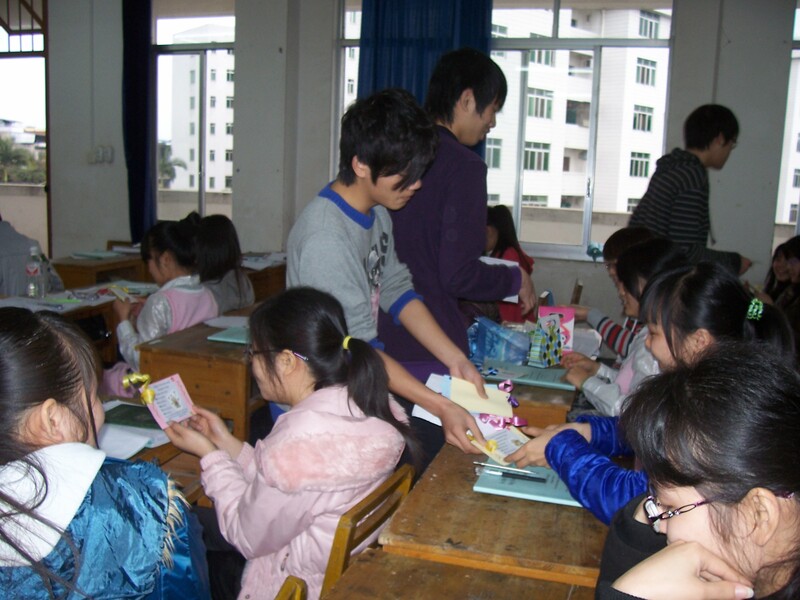 They also presented their classmates with handmade favors. These they made in my home on the weekend. 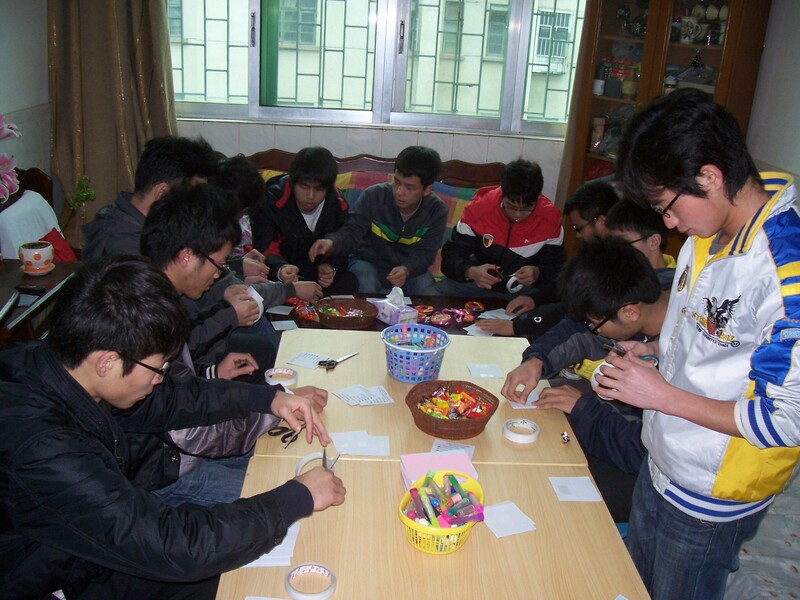 In my home, the guys are busy making IWD favors for their female classmates. Their enthusiasm and careful planning for our special event certainly made our International Women’s Day an enviable one on campus. I’m hoping one year, other departments will follow suit and treat their female students with just as much enthusiasm as my English major men. From China, here’s wishing all the women out there a noteworthy and meaningful International Women’s Month of March!